Almshouses with the old school behind them (centre of the picture). 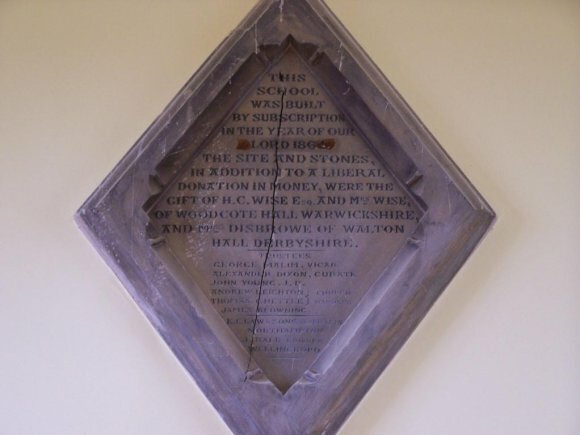 In 1760, Abigail Bailey and Ann Levett of Walton-on-Trent, Derbyshire, purchased 23 acres 36 pole of land in Hargrave for £260, the income from which was to fund the education of the children of the parish through a free school. By 1849 the income provided £28/year and in 1869 this had risen to £48/year, but had dropped to £30/year by 1890, so in 1908 the Trustees sold the land for £500. The first dedicated school building was dated 1820 and can be seen on the middle of the image above, to the right of the old almshouses. Both the old school and almshouses have been demolished. Children outside the new school building. 1864 Dedication plaque inside the new school. The new school building was built using materials provided by Henry Christopher Wise in 1864 whilst Lord of the Manor. It was built to school up to 100 children and provided an adjacent dwelling for the schoolmaster. The architect was E.F.Law & Sons of Northampton and it was built by J.Ball of Wellingborough. The building is owned by the Educational Foundation of Abigail Bailey and Ann Levett. The Trustees appointed the majority of the School Managers (the Parish Council also appointed one), who employed the teachers and caretakers. The school adopted the national syllabus in 1895. 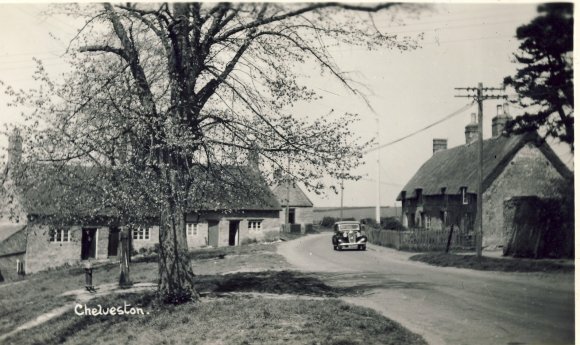 In 1947, the county Education Committee's development plan proposed the closing of Chelveston school (the children to attend the school at Higham Ferrers), as it was considered that whilst village schools were of great value to the village community – as a national social centre, and in the advantage to the villagers of the presence of the headmaster or mistress, there was difficulty in the "one-teacher school" of giving proper education to children varying in ages from 5 to 14. It would be another 20 years before this actually happened! 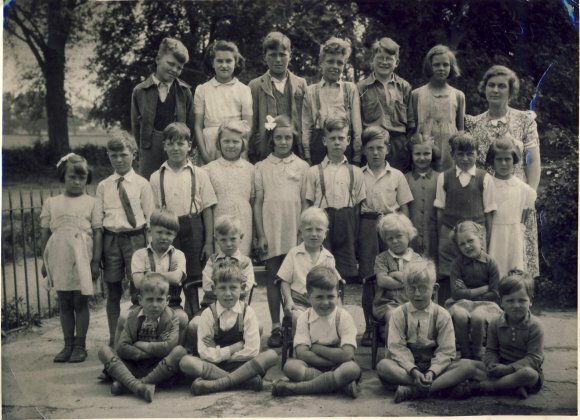 The Education Act 1944 gave voluntary schools a choice of funding – either "Controlled", whereby all the costs were paid by the State, but the school was controlled by the Local Education Authority (LEA) or "Aided", where 50% of the costs were paid by the State, but the Trust retained control of the school. In 1951 the Trustees chose to become a Voluntary Aided school and in 1956 successfully applied to the Peterborough Diocese Education Committee to pay the other 50% of the costs. 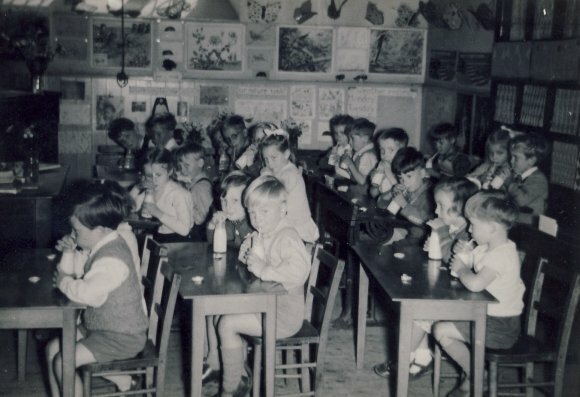 The School Milk Act 1946 provided free milk in schools - a third of a pint a day. This is one of the two classrooms, divided by a sliding wall. 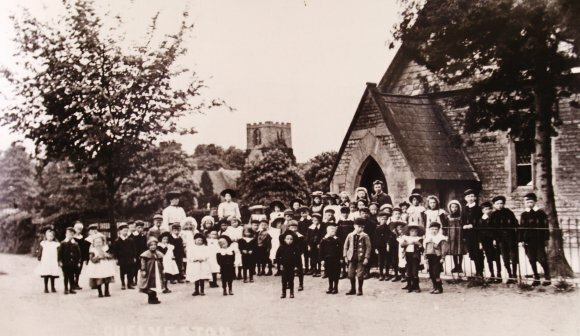 With falling numbers, the school was closed by the Northamptonshire LEA in December 1967 (the following year they abandoned the policy of closing rural village schools!) and remained empty until re-opened as the Village Hall in 1972 (following the collapse of the former Village Institute building in heavy snow in March 1970). The former School is now the Village Hall and the Schoolmaster's house is now a private dwelling. List (incomplete) of school teachers from 1841 - 1967. A school reunion was held in 1998 of the class of 1947. The reunion was organised by Richard Burton, Noel Morris & Horace Eady. 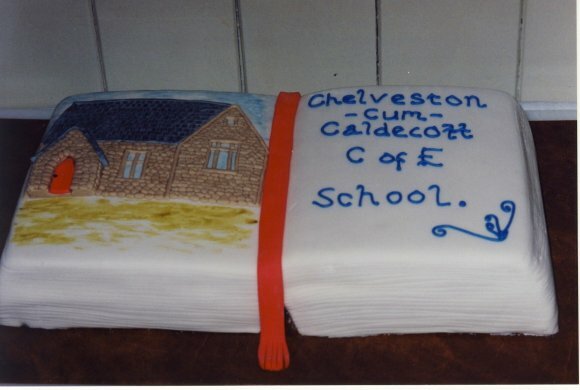 The images below show the original class and what they looked like in 1998, plus the cake made for the occasion by Isobel Stewart. Top row: Richard Burton, Billy Stewart, Michael Parsler, Horace Eady, David Bettles, Pauline Smith & Mrs Doreen Mason (Head Teacher). Second row: Gillian Dunnit, Terry Baxter, Cliff Saddington, Maureen Chapman, Marian Felce, Noel Morris, Robert Tate, Marina Dunmore, Dennis Conquest & Diana Watts. Third row: Tony Dunnit, Barry Sauntson, George Tate, Jennifer Bridge & Gill Eady. Bottom row: Kenny Smith, Bob Bridge, Alan Parton, Michael Dunnit & Patrick Taylor. Missing from the photograph is Jill Bridge. Top row: Richard Burton, Billy Stewart, Michael Parsler, Horace Eady, David Bettles & Pauline Smith. Second row: Terry Baxter, Maureen Chapman, Marian Felce, Noel Morris, Robert Tate, Dennis Conquest & Diana Watts. Third row: Barry Sauntson, George Tate, Jennifer Bridge, Jill Bridge & Gill Eady. Bottom row: Kenny Smith, Bob Bridge, Alan Parton & Michael Dunnit.